You will really enjoy this 3 bedroom 2 bath penthouse , 4th floor condo (the largest condo available in Windsor Hills resort) with a great view located in the highly desirable resort of Windsor Hills. 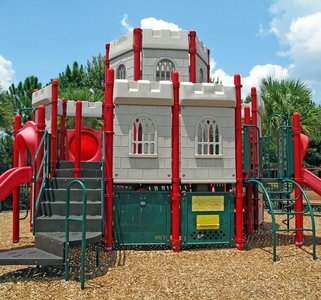 The community is conveniently located just 1.5 miles from Walt Disney World. Windsor Hills is a gated community with 24-hour manned security and is ideally located near an abundance of shops, restaurants, supermarkets, and other amenities. 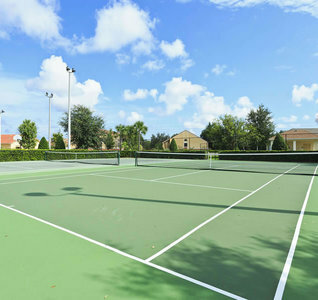 Windsor Hills location and amenities are unparalleled to any community in the area. Take the elevator to this bright and airy 1450 sq ft, fourth floor condo that sleeps 8 guests. The master bedroom offers a King sized bed and private bathroom and walk in closet. The second bedroom has a Queen bed with and the 3rd bedroom is a Mickey themed room and features two sets of bunk beds for the kids. A PS2 is available in the bunk bedroom. You will really enjoy the fully equipped kitchen with a full sized refrigerator with ice maker, oven/flat top burners, dishwasher, microwave, blender, toaster, coffee maker dishes, utensils, silverware, pots, and pans etc. The kitchen is open to the dining and living areas so that the cook in the family can be involved in all of the conversations taking place. Next to the kitchen is the dining area that provides combined seating for up to 8 guests where you can serve from the kitchen opening. 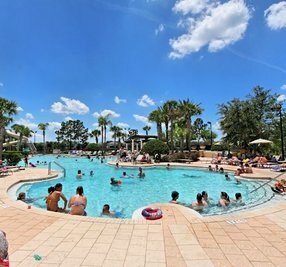 This Orlando Disney area condo boasts a living room with two great comfortable sofas, occasional tables, lamps, large 50 inch big screen TV and DVD player, and an iPod/iPhone sound system for your enjoyment. The living room opens onto a private screened balcony where you can relax and enjoy the view. You will also enjoy FREE WiFi and FREE local calling. For your traveling convenience we also provide, Free of Charge, a Pak n Play, stroller & high chair for those traveling with little ones. All bed linens, towels, vacuum cleaner, full size washer and dryer, iron and ironing board, alarm clocks and hair dryer are in the condo as well. We are a family of 5 who spent 12 enjoyable nights in this cheerful condo. The unit was clean, spacious and fully equipped, including 4 TVs and very comfortable beds. It is decorated beautifully and is very peaceful and quiet on the upper floor. 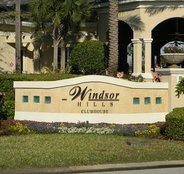 Windsor Hills is a securely guarded and gated resort. The pool is amazing and we even enjoyed the private movie theater. The owner is very responsive and answered all of our inquiries prior to arrival very promptly. Very easy booking process. 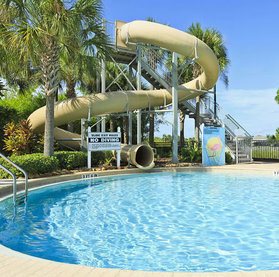 We definitely recommend this condo and resort! First off, I would like to say that the property owner & property managers were extremely lovely to work with. They were always very prompt to reply to any questions or concerns that I had. Not only did the owner offer information about his property, but also answered many of my questions regarding our trip to Disney World, and gave great suggestions regarding shopping/touring/planning, etc. We were repeated long term renters of this unit and were very pleased. It is on the fourth floor and is very quiet. The unit was clean and well equipped for our long term stay. The unit has four TV's with free WIFI. One unit is equipped with a gaming system and there are several game cd's provided. The unit in the family room is a new 55" Vizio and provides very nice HD picture quality. The Windsor Hills facility is a great place to stay. It is a great place to spend time regardless of your age. This is a place you will enjoy staying for a long term or for shorter term with a family. Thank you Lynn and Barry. We had a great time staying at your Condo. It was very comfortable, roomy and felt like home. We liked that it was so close to the pool and my mother felt extremely comfortable walking around the community. We would stay there again and I would definitely recommend your condo. Lise C.
We have rented homes at Windsor Hills in the past and have had nothing but great things to say about our times there. As newly retired people, we decided to try a condo for an extended period. It was a great experience...a home away from home. Barbara, the maintenance contact was available and quickly addressed the few issues we had. The home was comfortable and maintained well. We will be back next year! 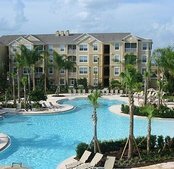 Darlene R.
The condo was very spacious and clean and the location was really close to Disney. We had a great view of the Disney fireworks from the condo balcony which was really cool and fun for the kids! My five year old loved the bunk beds at the condo. Condo was well stocked with everything you need, even had a couple pack n plays, strollers, high chair, etc. They really thought of everything to make it convenient for families! We would definitely try to stay here again the next time we plan a Disney trip! Kathy B. 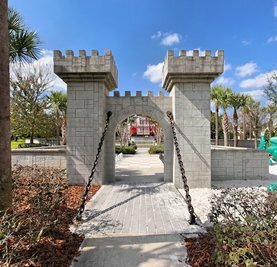 As a family we have been to Orlando a few times but this vacation rental is by far the best we have rented. The condo is big and spacious. Everything we needed to feel like we were home was supplied. The pool area was awesome along with the club house. All the parks ate within a 10 minute drive. 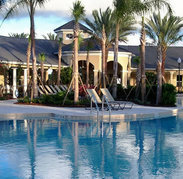 The resort is well maintained and staff ate friendly. I will be back for many years to come. I highly recommend this vacation resort Mary C.
Just wanted to say a big thank you and how much we enjoyed staying in your condo. It had everything that we required to make our stay comfortable. We loved how close it was to Disney, and convenient to get to Walmart. If we decide to come back to Orlando next year, I will definitely get in touch. Rochelle N.